That’s somewhat of a blunt quote. But I like it. Welcome back from your long weekend. Then came the ensemble of Eurocrats, led by Draghi, who said the “ECB is ready to do its part.” Then the Russians, the Qataris, etc. on “freezing production”… But now what? What happens when the market no longer believes them? What happens when the music stops? By definition, bulls begging for more central-market-planning cowbell (not the most soothing music btw) validates most of my concerns on both #Deflation and #GrowthSlowing. The funniest mainstream market headline yesterday had to be “Japanese stocks rocket on stimulus rumors” (after a government report that Japan’s GDP slowed another -0.4% in Q4). Sure, both Japan and Europe had 1-day bounces within their respective stock market crashes yesterday, but neither of them were able to show follow through this morning on either the FX Burning Experiment or equity “reflation.” They are losing control. Day trades are fun to watch, but the savages of this bear market know that it’s all about nailing the intermediate-term TRENDs that’s getting us fed. So don’t be afraid of “rallies”; take a deep breath and contextualize them. In other words, the transmission mechanism (or belief system) that either the Europeans or Japanese can devalue their currencies and reflate their stock markets is crashing. Moreover, the hope that “Down Dollar” will reflate US stocks was dead wrong too. While the inverse correlation between the US Dollar and commodities, junk bonds, and emerging markets remains consistent, what’s actually happened in the last 15-30 days is that the SP500 has developed a POSITIVE correlation to USD of +0.5-0.7. Since that’s super short-term, I would simply monitor that (as I do with all things “new” issued by Mr. Macro Market himself). What it might be signaling is that the only way out for the USA is via a #StrongDollar, Strong America policy. 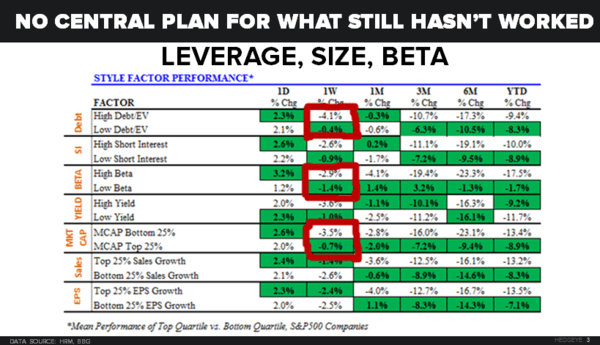 Sorry, Jamie (JPM) – the market is well aware that you have massive cyclical exposures to levered Energy companies, Real-Estate, and Yield Spread compression. You’re a smart guy, but you can’t centrally plan a “market bottom” inasmuch as Draghi and Kuroda can’t. Ignorance never ends bear markets; it perpetuates them. 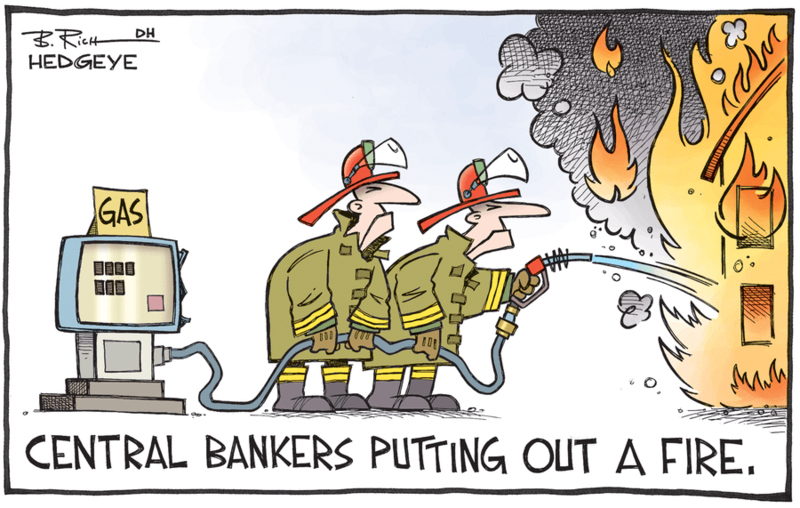 Other than Oil deflating another -4.7% last week (-22.9% for the YTD alone) and Bond Yields continuing to crash (UST 10yr Yield down another -9 basis points on the week to 1.75%) what other US Equity Style Factor messages were in the market last week? #Deflation is economic gravity’s beast. If you want to try to “soothe” it, you’re going to need a lot more than the BOJ, ECB, PBOC, OPEC, and Fed’s baseball bats.